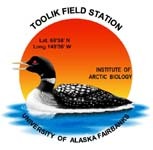 » Zooplankton density for all samples collected from Toolik Lake and lakes near the Toolik Field Station, Arctic LTER 2003 - 2011. The samples were taken with a 30 cm diameter plankton net with 156 um mesh plankton netting. In almost all cases replicate vertical tows were taken with the length varying on the depth of the lake. Once on the lake the net is slowly lowered being sure that it goes down open side up, stopping briefly at the depth of the tow and then at about a meter per second pulling the net to the surface. The contents of the net are washed down until it will fill about half the sample bottle. It is then emptied into the labeled sample bottle. The samples were preserved in an alcohol/formalin solution and stored in 250 ml Nalgene bottles. The samples were counted by taking a subsample of 1 or 2 mL from the bottle and enumerating all zooplankton by species using a M-5 stereomicroscope. If less than 10 individuals of any taxon were recorded in the sample, the entire sample was enumerated for that taxon. Samples were collected by members of the laboratory of W. John O'Brien from 2003-2008. From 2009-2011 samples were collected by member of the laboratory of Chris Luecke. All samples were counted and enumerated by Shannon Babb, Katie Fisher, or Heather Gooding at Utah State University. In the laboratory, the samples were counted by taking a subsample of 1 or 2 mL from the bottle and enumerating all zooplankton by species using a stereomicroscope at between 5x and 16x. Rinse preservative from samples in small mesh (&lt;156 micron) funnel. Pour all of sample into a large petri dish to scan for large, rare critters (Chaoborus, amphipods, insects). Add these counts to count sheet under total sample. Pour the sample into a larger metered container. Collect a subsample (1 ml out of 100 ml is common). Place the subsample into a counting tray. Count all of the individuals by taxa. Count two additional subsamples (don’t need additional measurements, but try to get a total of 10 individuals measured. All samples were counted and enumerated by Shannon Babb, Katie Fisher, or Heather Gooding.